a complete range of plastic and smartcard production services. Contactless smart cards use radio frequency identification (RFID) technology to wirelessly communicate with a card reader. 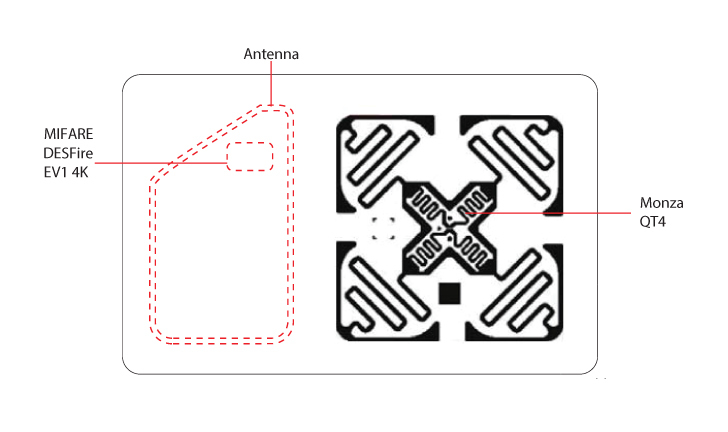 A copper or aluminum antenna is connected to an integrated circuit (chip) and then securely laminated inside the plastic card body under high heat and pressure. Contactless smart cards range from simple memory cards with low security and non-volatile memory structure up to high security crypto-processor cards and Java / Native operating system (OS) cards. Cardzgroup uses specialty formulated PVC and PET that allows us to manufacture the thinnest ISO contactless cards while eliminating the antenna and chip blemish found on many lower quality smart cards. EM4100 / EM4200: Simple read-only chip with 128 bit factory programmed UID used in access control, anti-counterfeiting and logistics. TK4100: Simple read-only chip with 128 bit factory programmed UID used in access control, anti-counterfeiting and logistics. EM4450 / EM4550: Read/Write chip with 1Kbit EEPROM and password protection used in ticketing, access control and prepayment devices. ATA5577 / T5577: Read/write chip with 363bit EEPROM and write protection, used in access control, hotel keycards, logistics and gaming. Hitag 1: Read/Write chip with 2Kbit EEPROM used in logistics, asset tracking, industrial ID and automation. Hitag 2: Read/Write chip with protected 256bit EEPROM and multi-tag operability used in logistics, asset tracking, casino gaming and industrial automation. Hitag S: Read/Write chip based on Hitag 1 available in 256bit and 2048bit options used in logistics, asset tracking, brand protection and automation. Icode SLI: ISO 15693 chip with 1024bit EEPROM and password protected read/write. Icode SLI-S: ISO 15693 chip with 1280bit EEPROM and password protected read/write. Icode SLI-X: ISO 15693 chip with 896bit EEPROM. Icode SLI-X2: ISO 15693 chip with 2528bit EEPROM and password protected read/write and 16bit counter. SRT512: ISO 14443B chip with 512bit EEPROM and write protection. SRi512: ISO 14443B chip with 512bit EEPROM including 160bit OTP memory and write protection. SRi2k: ISO 14443B chip with 2048bit EEPROM including 160bit OTP memory and write protection. SRi4k: ISO 14443B chip with 4096bit EEPROM including 160bit OTP memory and write protection. SRiX4k: ISO 14443B chip with 4096bit EEPROM including 160bit OTP memory and write protection and proprietary anti-cloning tech. LRi1K: ISO 15693 chip with 1024bit EEPROM and high (up to 1.5m) read range. LRi2K: ISO 15693 chip with 2048bit EEPROM and high (up to 1.5m) read range. LRiS2K: ISO 15693 chip with 2048bit EEPROM plus password protection and high (up to 1.5m) read range. LRiS64K: ISO 15693 chip with 65536bit EEPROM plus password protection and high (up to 1.5m) read range. Texas Instruments TI Tag-it HF-I: ISO 15693 chip with 64bit factory-programmed UID and 256bit EEPROM user programmable memory. Texas Instruments TI Tag-it HF-I Plus: ISO 15693 chip with 64bit factory-programmed UID and 2048bit EEPROM user programmable memory. Texas Instruments TI Tag-it HF-I Pro: ISO 15693 chip with 64bit factory-programmed UID and 256bit EEPROM user programmable memory including password write/password kill function. Legic Prime MIM256: ISO 14443"F" chip with 256byte EEPROM and proprietary Legic RF protocol. Legic Prime MIM1024: ISO 14443"F" chip with 1024byte EEPROM and proprietary Legic RF protocol. Infineon my-d vicinity SRF 55V02P: ISO 15693 and ISO 18000-3 chip with 2.5Kbit EEPROM and both plain and secure modes. Infineon my-d vicinity SRF 55V10P: ISO 15693 and ISO 18000-3 chip with 10Kbit EEPROM and both plain and secure modes. Infineon my-d move SLE 66R01LN: ISO 14443A chip with 576bit EEPROM. Infineon my-d move SLE 66R01PN: ISO 14443A chip with 1216bit EEPROM. Atmel AT88SC0808CRF: ISO 14443B chip with 1024byte EEPROM and 256byte configuration zone with cryptomemory and 64-bit Mutual Authentication Protocol. Atmel AT88SC1616CRF: ISO 14443B chip with 2048byte EEPROM and 256byte configuration zone with cryptomemory and 64-bit Mutual Authentication Protocol. Atmel AT88SC3216CRF: ISO 14443B chip with 4096byte EEPROM and 256byte configuration zone with cryptomemory and 64-bit Mutual Authentication Protocol. Atmel AT88SC6416CRF: ISO 14443B chip with 8192byte EEPROM and 256byte configuration zone with cryptomemory and 64-bit Mutual Authentication Protocol. NTAG203: Early NFC Forum Type 2 tag with 168byte memory. Cost effective and can encode up to 132 total characters. NTAG210: Limited availability NFC Forum Type 2 tag with 80byte memory. Cost effective and good read range, can encode up to 41 total characters. NTAG213: Replacement for NTAG203 - NFC Forum Type 2 tag with 180byte memory. Cost effective and excellent read range, can encode up to 132 total characters. NTAG215: Limited availability NFC Forum Type 2 tag with 540byte memory. Good read range and can encode up to 492 total characters. NTAG216: Higher priced NFC Forum Type 2 tag with 924byte memory. Good read range and can encode up to 854 total characters. Topaz 512: NFC Forum Type 2 tag with 512byte memory. Good read range and can encode up to 449 total characters. MIFARE Ultralight®: NFC Forum Type 2 tag with 64byte memory. Cost effective with good read range and can encode up to 41 total characters. 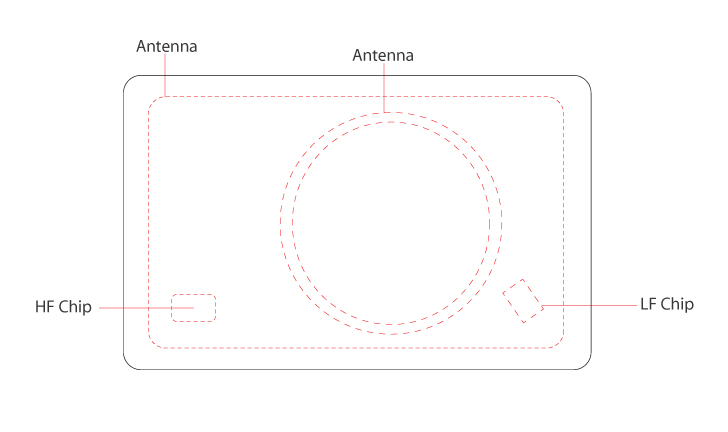 MIFARE Ultralight® C: NFC Forum Type 2 tag with 192byte memory and encryption. High price with low read range and can encode up to 132 total characters. Infineon my-d NFC SLE 66R16P: NFC Forum Type 2 tag 2048byte EEPROM and up to 1024bytes NFC memory. Infineon my-d NFC SLE 66R16P: NFC Forum Type 2 tag 4096byte EEPROM and up to 2048bytes NFC memory. Alien Higgs 3: EPC Class1 Gen2 chip with 96—480bit EPC memory, 512bit user memory and 64bit UTID with memory read protection. Alien Higgs 4: EPC Class1 Gen2 chip with 128bit EPC memory, 128bit user memory and 64bit UTID with memory read protection and pre-encoded with unalterable enterprise-wide serialization scheme. NXP UCODE 7: EPC Class1 Gen2 chip with 128bit EPC memory and 96bit UTID. NXP UCODE 7m: EPC Class1 Gen2 chip with 128bit EPC memory, 32bit user memory and 96bit UTID. NXP UCODE I2C: EPC Class1 Gen2 chip with 160bit EPC memory, 3328bit user memory and 96bit UTID with two independent UHF interfaces and ability to link to I2C interface. NXP UCODE G2iM: EPC Class1 Gen2 chip with 128-448bit EPC memory, 640-320bit user memory and 96bit UTID with memory read protection and ability to segment memory into open, protected, and private modes. Also has ability to conditionally reduce read range based on activation condition defined by user. NXP UCODE G2iL: EPC Class1 Gen2 chip with 128bit EPC memory and 64bit UTID with memory read protection. NXP UCODE G2iL+: EPC Class1 Gen2 chip with 128bit EPC memory and 64bit UTID with memory read protection and tag tamper alarm and ability to conditionally reduce read range based on activation condition defined by user. Impinj Monza 4D: EPC Class1 Gen2 chip with 128bit EPC memory, 32bit user memory and 96bit UTID with support for omni-directional antennas. Impinj Monza 4E: EPC Class1 Gen2 chip with up to 496bit EPC memory, 128bit user memory and 96bit serialized TID with support for omni-directional antennas. Impinj Monza 4QT: EPC Class1 Gen2 chip with 128bit EPC memory, 512bit user memory and 96bit serialized TID with support for omni-directional antennas and ability to create a separate public and private (password protected) data profile on the same chip. Impinj Monza 5: EPC Class1 Gen2 chip with up to 128bit EPC memory, 32bit user memory and 48bit serialized TID. Impinj Monza R6: EPC Class1 Gen2 chip with 96bit EPC memory and 48bit serialized TID. Impinj Monza R6-P: EPC Class1 Gen2 chip with up to 128bit EPC memory, 64bit user memory and 48bit serialized TID. Impinj Monza S6-C: EPC Class1 Gen2 chip with 96bit EPC memory, 32bit user memory and 48bit serialized TID with one way fail-safe counter for ticketing and metering applications. 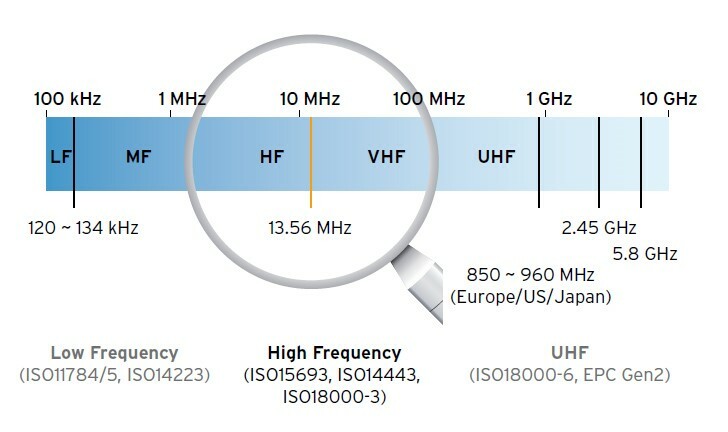 Low Frequency + High Frequency: LF + HF cards are the most common dual-frequency cards and usually have an HF antenna laminated around the outside of the card with a thick coil LF antenna contained within. 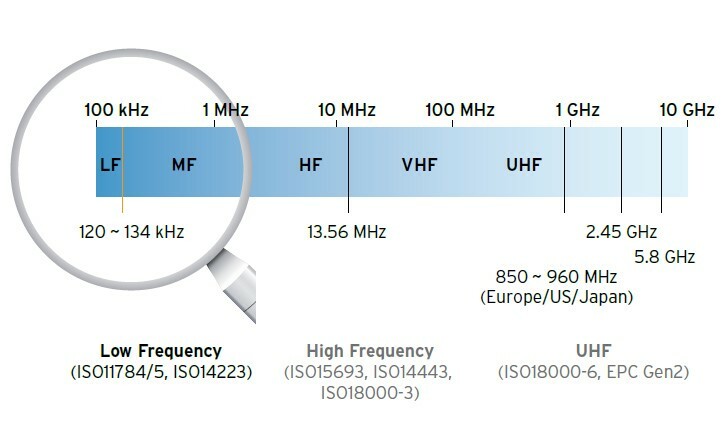 Legacy LF systems like HID prox are often replaced by higher security HF implementations that still require usage of the original LF chip while all sites convert to the newer HF standard. 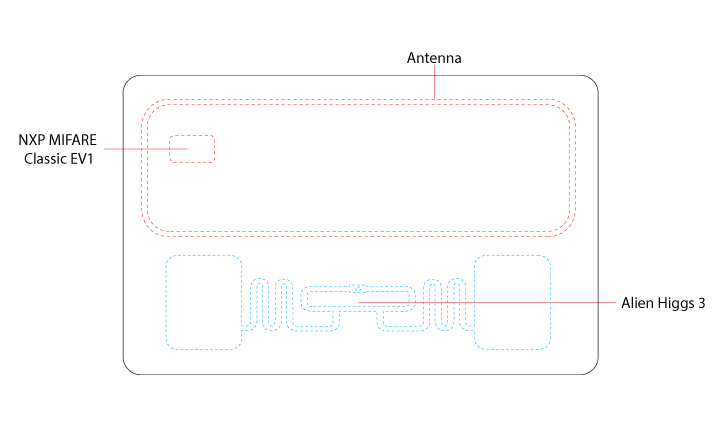 High Frequency + Ultra High Frequency: HF + UHF cards are becoming increasingly popular in loyalty and payment schemes that also want to track attendance and location of a customer. These hybrid cards generally have the UHF chip placed separately above or to the side of the HF chip to ensure there is no interference. Low Frequency + Ultra High Frequency: LF + UHF cards are used in specialized situations where simple access control is required alongside personnel tracking. 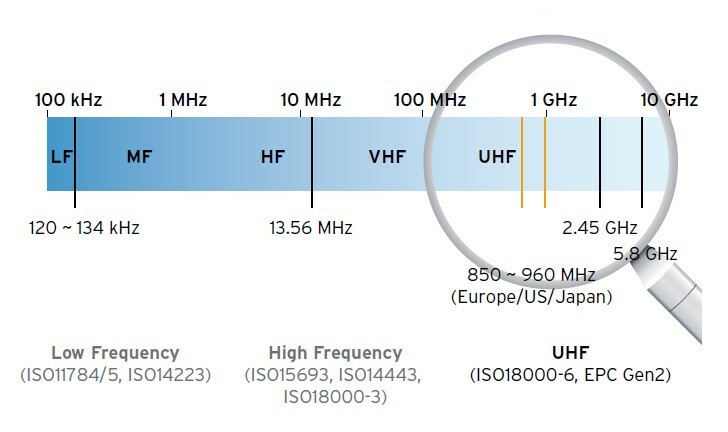 Like HF + UHF hybrid cards, LF + UHF is generally accomplished with the LF antenna running above or beside the UHF antenna. evolution came in 2002 with the introduction of the MIFARE DESFire chip. loyalty, education and access control applications. compatible with all MIFARE Classic 1k systems and contains a digital signature to ensure the chip is a genuine NXP product. NXP MIFARE Classic 4k: Original MIFARE chip with 4096byte EEPROM and 4-byte / 7-byte UID options. Used in simple ticketing, loyalty, education and access control applications. NXP MIFARE Classic EV1 4k: Replacement to the original NXP MIFARE Classic 4k, the newer EV1 version is completely backwards compatible with all MIFARE Classic 4k systems and contains a digital signature to ensure the chip is a genuine NXP product. NXP MIFARE Ultralight: MIFARE chip with 64byte EEPROM, 32bit user definable OTP area and 7-byte UID. Used in disposable transport tickets, event ticketing, and loyalty applications. backwards compatible with all MIFARE Ultralight systems and contains a digital signature to ensure the chip is a genuine NXP product. NXP MIFARE Ultralight C: MIFARE chip with 192byte EEPROM, 32bit user definable OTP area and 7-byte UID. UL-C is more secure than standard Ultralight as it has 3DES authentication which can be used to secure sections of user memory from write or read/write with a 128bit key. Used in disposable transport tickets, event ticketing, loyalty and prepaid applications. NXP MIFARE Mini: MIFARE chip with 320byte EEPROM and 4-byte / 7-byte UID options. Used in applications where quick transaction time is more important than large memory size such as public transport, event ticketing, and gaming/loyalty. Virtual Card: Command set that includes function to select one-out-of-many virtual cards that can be emulated by a single NFC device. Proximity Check: Prevents relay attacks through precision measurement of the time that elapses between a command being sent by the reader and the card's answers. 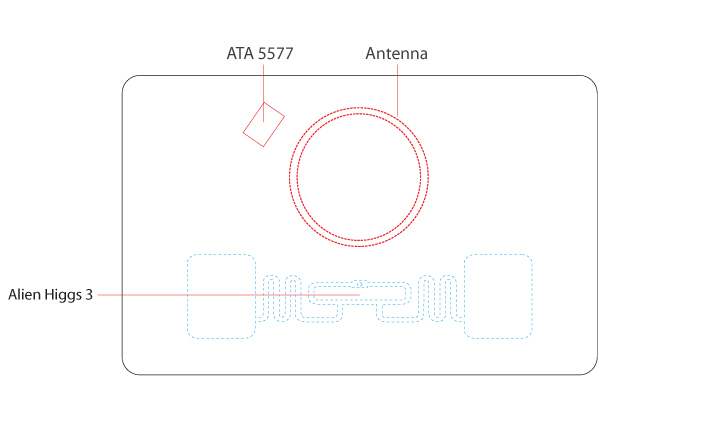 Security Levels: MIFARE Plus has four distinct security levels that can be chosen. Level 0 is how the chips are delivered from NXP and is the stage of every chip before any personalization has been done. Level 1 uses the same weak security (Crypto-1) as MIFARE Classic and so can be used to replace existing Classic cards without having to replace readers or firmware. Level 2 uses the Crypto-1 communication stream but the encryption keys are generated on the fly by AES-based authentication which in theory combines the security of AES with the speed of Crypto-1. Level 3 uses only AES and is the level at which MIFARE Plus becomes truly secure. MIFARE Plus S: stands for "Slim" and is the lightweight version of Plus. It is meant to provide a low-cost and straightforward migration from MIFARE Classic and does not support Security Level 2 or "Proximity Check" with only partial support for the "Virtual Card" scheme. MIFARE Plus X: stands for "eXpert" and is the full feature version, offering the entire suite of Plus security upgrades and providing more flexibility to optimize the command flow for speed and confidentiality. NXP MIFARE Plus 1k S: Entry level MIFARE Plus upgrade from MIFARE Classic chip with 1024byte EEPROM and 4 byte UID. NXP MIFARE Plus 2k S: Cost effective MIFARE Plus chip with 2048byte EEPROM and 4 byte / 7 byte UID options. NXP MIFARE Plus 2k X: Full featured MIFARE Plus chip with 2048byte EEPROM and 4 byte / 7 byte UID options. 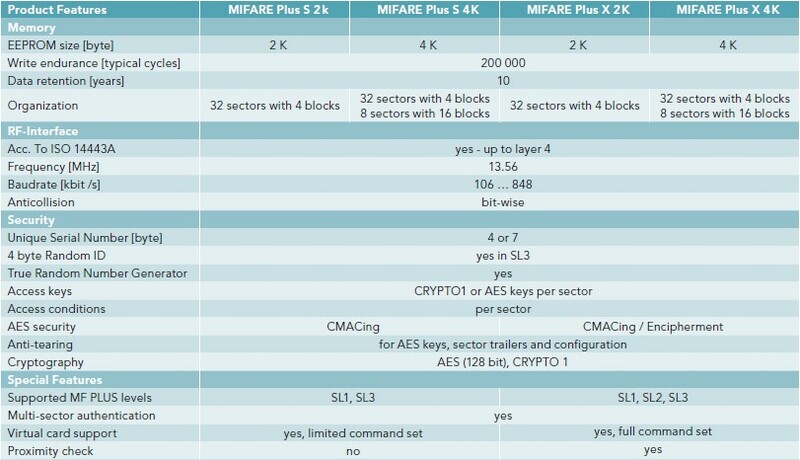 NXP MIFARE Plus 4k S: Cost effective MIFARE Plus chip with 4096byte EEPROM and 4 byte / 7 byte UID options. NXP MIFARE Plus 4k X: Full featured MIFARE Plus chip with 4096byte EEPROM and 4 byte / 7 byte UID options. MIFARE DESFire cards are meant for applications that require a much higher security level than standard MIFARE products. DESFire provides a highly secure microcontroller-based IC that comes preloaded with NXP's proprietary DESFire operating system, allowing users to take advantage of an on-chip directory structure that can hold up to 28 different applications and 32 files per application. The original DESFire 4k v.06 (MF3ICD40) was discontinued in 2010 and is replaced by the more secure DESFire EV1 version. With DESFire EV1, true 128-bit AES encryption is now standard across all DESFire products, and both hardware and software have been Common Criteria EAL4+ certified. 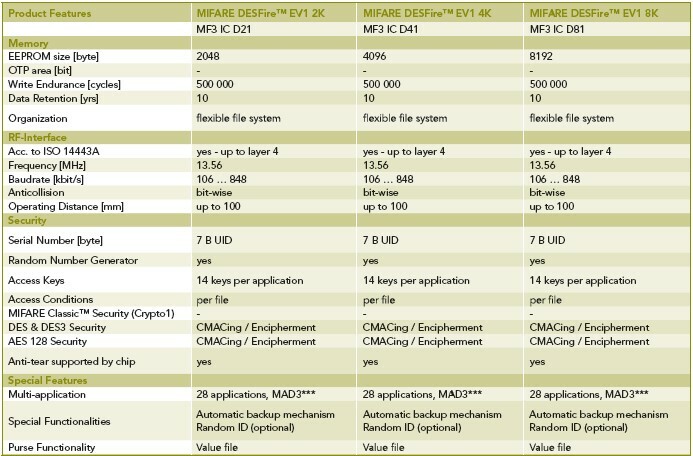 NXP MIFARE DESFire EV1 2k: DESFire EV1 chip with 2048byte EEPROM and flexible file system, including automatic backup mechanism and optional Random ID. NXP MIFARE DESFire EV1 4k: DESFire EV1 chip with 4096byte EEPROM and flexible file system, including automatic backup mechanism and optional Random ID. NXP MIFARE DESFire EV1 8k: DESFire EV1 chip with 8192byte EEPROM and flexible file system, including automatic backup mechanism and optional Random ID. 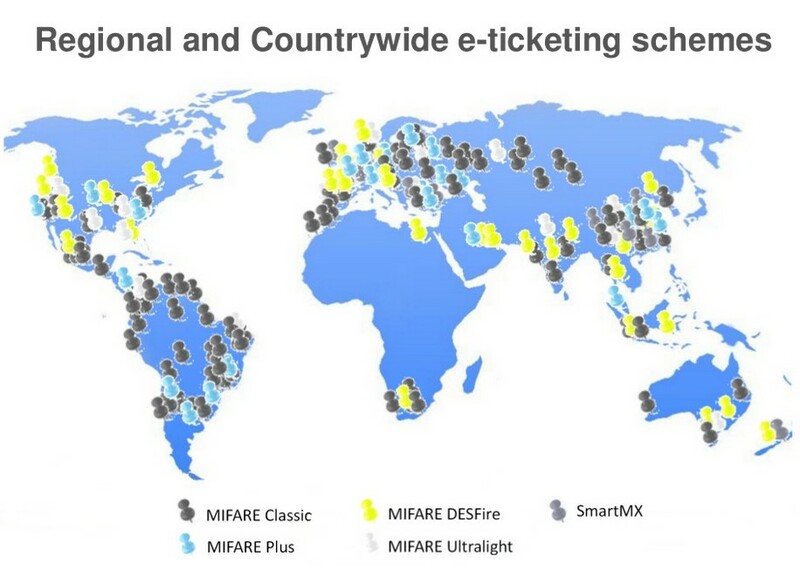 *MIFARE and MIFARE Classic are trademarks of NXP B.V.